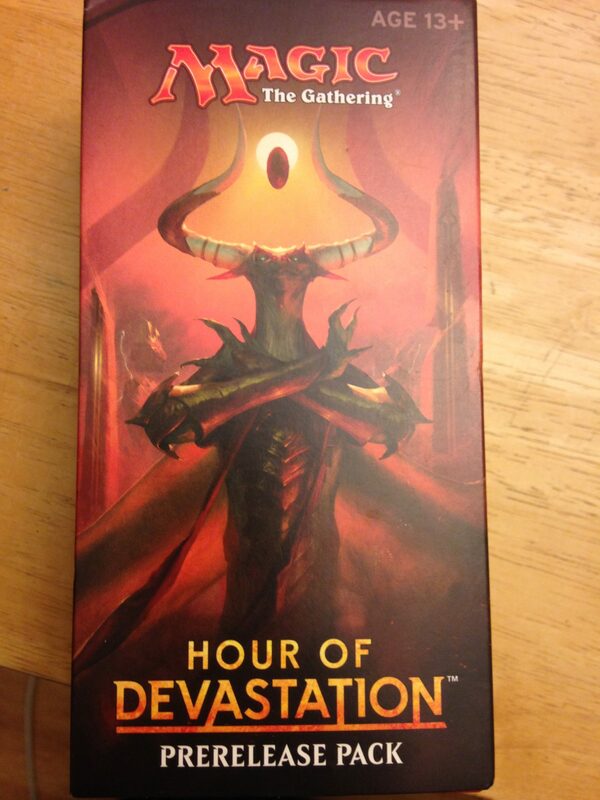 The Hour of Devastation prerelease box. Magic: The Gathering fans waited with bated breath leading up to last weekend: it was the prerelease event for Hour of Devastation, their first chance to get their hands on the newest Magic card set. I began my research into where to attend the prerelease early, as these events tend to sell out. Luckily for local fans, there are so many game stores in the Twin Cities that it’s hard to choose. Each one has its own system and will do slightly different promotional events for prerelease, but all stores follow a standard Wizards of the Coast format. Prerelease is billed as one of the most friendly and open Magic: The Gathering events anyone can attend. All participants pay a set amount for six booster packs of cards, which come in a fancy box (very exciting to open). Once you open all of them, you begin your deck-building process, creating a 40-card deck with only the cards from your prerelease packs. This is where it’s fun for newbies and old-timers alike, as it is the first time anyone has played with the new set. Far from secret, the deck-building process at prerelease is very open. You can ask questions from people sitting around you and from the store staff. If you need help or advice on deck building, this is the place to be. After your deck is ready, you are paired up randomly by staff to play games of Magic in rounds, generally five to six in total—that is 7 hours of nonstop fun! The best part is no one is disqualified for losing a match; you just play someone else. If you win, however, you get packs of cards as prizes. 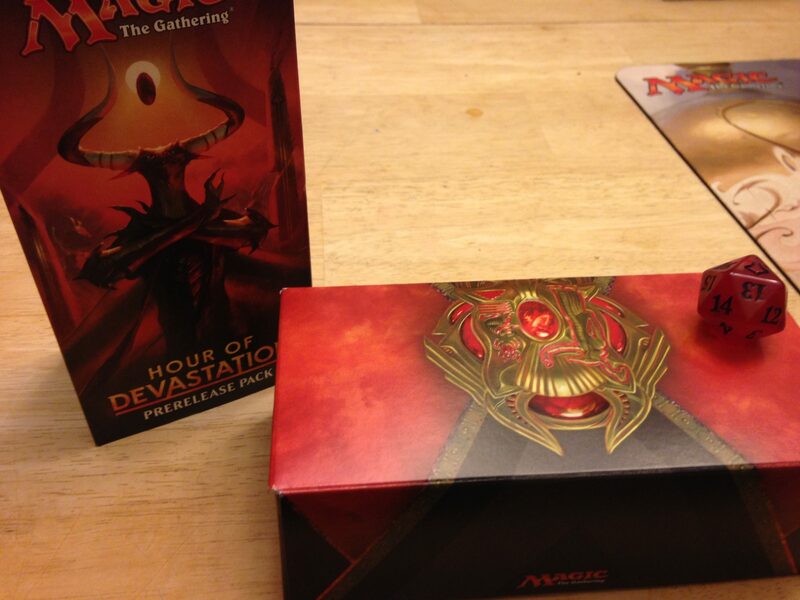 The prerelease box contains six booster packs and one unique 20-sided die. I ripped into my box like a 10-year-old on Christmas morning. Wrapping flew as I opened my packs, eager to see what I had gotten. While no Bolas planeswalkers were among my treasures, I got some excellent rare cards. I particularly loved Ammit Eternal, a Zombie Crocodile Demon, who shredded my opponent in game four. I carefully built my deck, stopping only to help out an eight-year-old and his dad who had never played Magic before. The day was amazing; although I only won one of my games, I got a booster pack and won the prize drawing for the new Dual Decks set. There was only one dark cloud on my prerelease day: with the exception of a very cool staff member, I was the only woman playing. I often wish that more women played Magic; it’s daunting to walk into a room with 95 guys and be the one “other.” Rather than let this stop me from playing or keep me at the kitchen table, however, I show up, stand up and be counted. After losing one of my matches, I wandered off to get a snack and people-watch. I saw parents and kids smiling and laughing and hipsters helping little kids figure out how to tap their cards. As I watched them collaborate and work together, I was reminded of all the ways that Magic: The Gathering brings people together. Even being the only woman in a sea of men, it was a positive experience. Mark your calendars for September 23 and 24, when Ixalan, a set featuring both pirates and dinosaurs, is set for prerelease. I’ll be the lady outside the comic-book store, recruiting, bribing and/or cajoling other women to come in and play Magic. Kendra is a lifelong vegetarian with an obsession for Magic: The Gathering, Harry Potter, and Little House on the Prairie. She also has been called a “paper hoarder” by various other papercrafting friends-her stack of 12x12 paper pads currently stands taller than she is. The last pre release I went to was Amonket (my spelling stinks) I thought it was fun, but I am a more casual Magic player. I agree I wish more women got into Magic!